Pastel or hot colours? 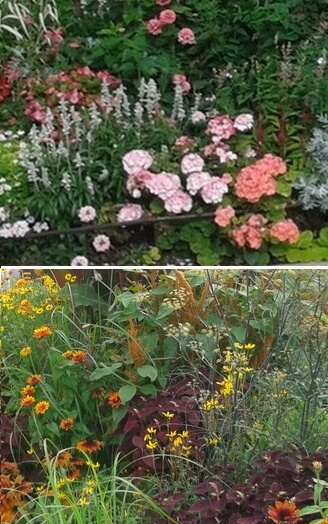 Try out colour schemes before committing to permanent planting. Many gardening columns will be talking about summer bedding plants as we reach the start of May and are able to plant out half hardies with confidence. I have written on this topic before and this time I am encouraging you to expand your view of what summer bedding can offer to a garden. By this I mean to get beyond the most common practice of laying out a bed or border of the same low growing summer bedding plants as last year and step out of your comfort zone. The Victorians loved carpet bedding to show the range and sheer numbers of half-hardy plants they could grow in heated glasshouses. But now the availability of ever new varieties of bedding plants from professional growers means that we can get more adventurous and experimental. If you are thinking of changing the permanent planting in a bed, why not use summer bedding to try out a colour scheme before investing in long term shrubs and perennials? If you have a border that has its permanent planting in place but those plants have not yet bulked up and spread to fill the space, how about filling the gaps with short term bedding plants? Create a bigger, bolder planting scheme: some tender plants can reach over a metre tall by the summer and you do not need to limit yourself to flowers: grasses provide contrast and their feathery heads last right into autumn. If you want a dramatic effect, especially in your front garden, you could use one of the newly fashionable huge plant pots in a fluorescent colour and fill it with dark purple foliage and flowers. If you have a large container to fill, then consider mixing a framework of permanent hardy plants and a shrub for winter height with your choice of summer bedding to grow between and trail over the front. That way you can have a different colour scheme every year without having to buy a full load of new plants. There so many choices and imaginative ways to use half-hardy and tender plants, you owe it to yourself to take full advantage of what is on offer. I would love to see some photographs of your creations.